The law has become the common man's prison. The Jacquerie, or Jacques, were what the 14th Century French nobility called the ‘common man”, or peasants. It was not a nice name, sort of like “Crackers”, “Rubes” or “sons of Ham.” That century was remembered for its peasant uprisings, both on the Continent and in Britain, and there is something to be learned from them. The Jacquerie Revolt began in France in 1358, shortly after the first Black Plague, which reduced the European work force by almost half, thereby, (as almost everyone knows) nearly doubling the value of the surviving peasants’ labor. So the nobility (the government), who did over half the hiring in those days, imposed laws forbidding anyone to be hired for any more than pre-plague wages. (Wage and Price Controls.) The Catholic Church (headquartered in France, not Rome, in those days, and enjoying some of its worst and most salacious press in all Church history) joined in to place additional threats of damnation (excommunication) on peasants if they sneaked to accept pay that exceeded wage limits, and small businessmen and farmers, if they offered it. The economy, as bad it was with 30%-40% mortality from the plague, was strangled. Production fell even more. Recovery was impossible. The European commoner was still a serf (a slave to the land where he lived) until the Plague more or less killed serfdom off, although it was slow in dying, taking more than a century. But it was especially slow in the eyes of society. They didn’t like the idea of people who had lived off the slops from the manor houses to suddenly be buying new burlap, and promenading up and down the streets as if they were regular people, even dropping into a dram shop for a pint. It wasn’t natural. (Do black folk know any of this?) Jacques were seen as and treated like dogs…but as long as they were baptized dogs, the Church didn’t care, so they could find no comfort there. You may understand “government subsidies” differently today, but in the 14th Century a “subsidy” was a tax placed on the people by the nobility because they could not pay all their bills from the gross receipts of their own lands, which, under the feudal system they were supposed to be able to do. So, a note on Government Baseline Budgeting in those days: The nobles owned almost all of the land in Europe, and already received rents and profits from that land that amounted to over half the wealth (GDP) of France. Subsidies (taxes) were then needed to cover the deficits they annually incurred since Middle Age bookkeepers had not yet figured out deficit financing. There were no continuing resolutions and debt limits to be increased. They paid up or lenders quit lending. (Novel idea, I know.) So just like congressmen, nobles spent a lot of time fundraising. But consider the outlays foisted upon them. Nobles had to pay for staff and general castle upkeep, ordinary fixed overhead; the torch bills, extra rock for mortar, etc. But then there were those damnable off-the-books expenses; the wife and daughters’ dress allowance down at Sachs Fifth de la Rue in Paris, the mistresses’ (plural) upkeep, weekend wenching money (petite cash) and then the priest’s special indulgences for absolution for all those mistresses and wenches (often taken out in trade), not to mention the occasional war to assist the King, or a cousin invading Austria or quelling an uprising in his own fief, or settling a land dispute in Italy, of which, in the 14th Century France alone, over a thousand are recorded. Finally, the parties (Wow!) , called “tournaments” in those days, which, even in the darkest and most desperate days of want in the country, ran for five-six days at a stretch, with a whole lot of slapping and tickling, fine dresses, both buttoned and not, sumptuous feasts, for up to 200-300 guests, over half the food never touched then thrown out, only not to the poor Jacques but for the swine. One English princess was so notorious that she regularly hocked the fine jewels her daddy the King and various unsuccessful suitors gave her, making Daddy buy them back, until finally, with a sigh of relief, he finally married her off at age 33, thus passing off his American Express Gold Card to his new son-in-law, saving his kingdom a fortune. “If God had not intended then to be sheared, He would not have made them sheep” is a line uttered by the bandit Calvera (Eli Wallach) about peons in Mexico, in the film The Magnificent Seven. This was the general sentiment of the European nobility toward commoners as their feudal serfdoms began to slip away after the Black Death. Consequently, the acquisition of money in the form of taxes not only to sate the nobility’s needs, but to keep this new class of free men from rising, became the bottomless pit of all government political planning, and the chief source of most social upheaval in Europe for several centuries — all because of the peasants’ co-equal desire to hold onto their meager earnings. “Know citizens, how you are despised,” spake a cobbler in 1379, as the new king of France searched for new ways to tax the people after his father, on his deathbed, had abolished all the taxes he had imposed on them, fearing Hell Everlasting for his sins for having done so. The revolt of the Jacquerie covered almost all of France, but only lasted a few weeks, before being suppressed brutally, at least as brutally as the Jacques themselves ripped and tore through hamlets, towns and cities themselves. After all, they were brutes. And they were not organized mobs, even if they had started out intending to be. With no real political or ideological agenda, or leaders, they simply wanted to get even. The respecters of no man (or woman, or child) they slashed, killed, raped, pillaged, plundered and torched everything that came within their reach. Taking London, they parlayed with the King, who promised then safe passage and tax relief. So, like the civilized men they had striven to become, they laid down their arms, and turned and marched home, only for that royal promise of pardon and relief to be instantly abrogated and the peasants mowed down like grass. 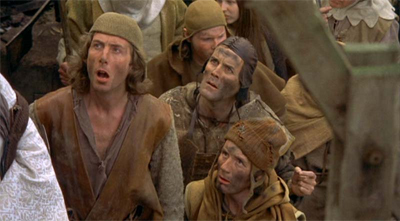 “Villeins (serfs) you were, villeins you are, and villeins you always will be.” one duke said. Much like today, the last thing on the minds of France’s nobility and its merchant class, as they jockeyed for strategic position against each other, in a chess match of incredibly complexity, (and inconsequence) was the possibility of an explosion from the object of all their plots and plans; the common man and the few pennies he kept in his pocket. Another law: Moral authority is no stronger than its acknowledgment. Beware of the common man, for they are always the ones you big players never plan for and make far too many (incorrect) assumptions about. But they always rise, as sure as God made little green apples. Be warned however, despised by all, they can become, and have proven to be, from time to time, to be just what their despisers wanted them to be…barbaric and undiscriminating, as to who and what they break, knock down or burn. Or hang. Respecters of no man. Maxine Waters has always threatened this very outcome, but again, beware, Maxine, for you never can be sure who’s side your Jacques will take once all their equally-despised kindred arise. Here at UP, we have tried every possible way to direct conservatives and other tea party activists toward organized mayhem against the current government, mayhem with a plan, a purpose, and a plausible end-result. But mayhem, nonetheless, to blight the king’s path. But recent actions by the government, in its high-handed, mean and spiteful way in dealing with ordinary citizens, each week providing new, even more ignominious examples, indicates that a darker, more ancient button is being pushed in the people, a button that no American has ever seen. The rising of the mob. Beware, for next time, they won’t pause to parlay. Been there, done that. Have Rolled up Newspaper, Will Travel.